Welcome to the website of the Hobkirk & Southdean linked with Ruberslaw congregations of the Church of Scotland! It is my privilege to invite you to share in the worship and life of the congregations, to experience the care of our Christian communities, and to engage in service and mission through our developing programme of activities. See what’s going on in the community. Read our latest quarterly newsletter. You will need Adobe Reader to view this. Or you can browse our archive of past newsletters. Our work in the local community. There is a Café Church in Denholm Village Hall on Sunday 10 February, 10.45am – 12noon, There will be NO service at Hobkirk & Southdean on this date; instead you are all warmly invited to join the café church at Denholm. Welcome to the website of the Hobkirk & Southdean linked with Ruberslaw congregations of the Church of Scotland! It is my privilege as minister to invite you to share in the worship and life of the congregations, to experience the care of our Christian communities, and to engage in service and mission through our developing programme of activities. I am the Rev Rachel Wilson BA MTh. I recently completed my probationary period as assistant minister at Maxton and Mertoun linked with Newtown linked with St Boswells where I gained much experience in all aspects of ministry. 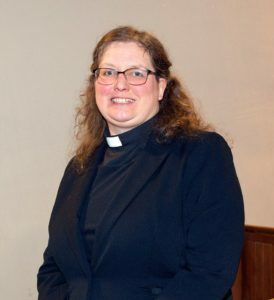 My first degree was a BA(Hons) in Theology and Religious Studies from Manchester University in 1995 and I gained a Masters in Theology and Religious Studies at Edinburgh University in 2017 as part of my ministry training. Before entering the ministry, my work included sales consultancy and being on the staff of the Berwick Citizens Advice Bureau. I am married to Graeme and we have two teenage children. We have lived at Westruther for many years where I was much involved in the church as a lay preacher and in running a youth group and a choir. Should you need to contact me on any pastoral matter, my telephone number is 01450 870874. Do you have a skill that could help us to run our church? Something you enjoy doing that you think would make a difference? Perhaps you have some spare time that you would like to use for the good of the local community? Speak to the Minister, or one of the elders and let them know!